Your customers may often complain about call quality when using VoIP. Their network connection may be slow. Or busy. Many VoIP applications need lower bandwidth utilization and greater robustness against packet loss and network congestion than is available from traditional VoIP solutions. Example VoIP applications needing better technology include (i) maritime or land VSAT connections with low committed information rates (CIR) and shared or contended links, (ii) DSL connections with low signal-to-noise ratios that can occur far from the central office, and (iii) call centers where the available bandwidth is exceeded during peak busy hours. In these networks, regular VoIP may both use more bandwidth than available and also have greater packet loss, with a significant decrease in call quality. Vobal provides a simultaneously higher quality and lower bandwidth service to address these important needs. Our solution leverages more than a decade of experience delivering VoIP service in some of the most technically challenging markets (such as maritime - one of the most technically challenging markets for VoIP around). Since hearing is believing, Vobal is providing a free trial in order to hear the high quality of VobalFEC VoIP. The high quality calling is also provided at the much lower bandwidth compared to regular VoIP. In order to test VobalFEC VoIP, you will need an analog telephone adapter of the model Linksys SPA-2102 or PAP2T. Note that the SPA-2102 is preferred for networks with higher levels of contention or congestion, but the low bandwidth and improved call quality can also be heard using the PAP2T on most networks. Vobal will add support for other ATA models in the future. Upon signup, you will receive an email with instructions for a one-line parameter to enter into your ATA, which will automatically download a full configuration file for your ATA to connect with the Vobal network. You can then place (limited) outbound calls and hear the high quality of VobalFEC VoIP at low bandwidth. 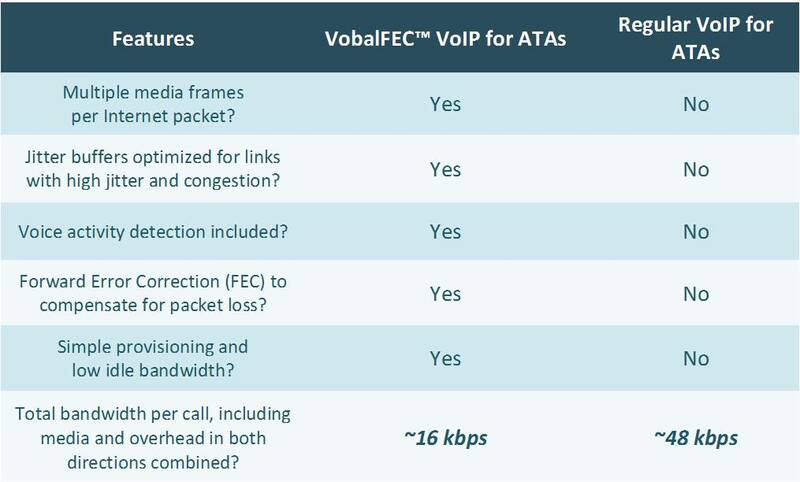 Vobal can provide even lower bandwidth VoIP with our S2 solution, which can optionally also include FEC. Total bandwidth per call with the Vobal S2 is approximately 6 kbps without FEC and 9 or 12 kbps per call with FEC. VobalFEC VoIP is available to service providers and resellers, and Vobal does not currently sell directly to end users. If you want to discuss utilizing VobalFEC for your company's VoIP offerings, or would like additional information, Contact Us. © 2016 Vobal Technologies LLC. All Rights Reserved.